Money Services: Credit/Debit cards accepted. ATMs available. Cashback available. 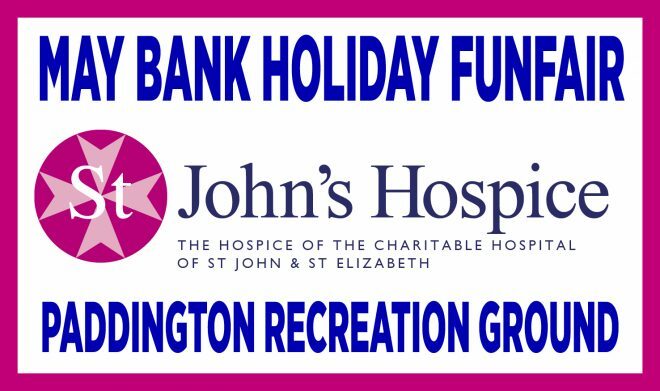 Come and join St John’s Hospice this May Bank Holiday at Paddington Recreation Ground, on Saturday 4th May to Monday 6th May. The Fair will be open daily 10am – 6pm, welcoming families and guests of all ages to celebrate with us while raising vital funds for the Hospice. Children can enjoy new and classic fairground rides there will also be music and entertainers. A fine selection of crafts and gifts will be on sale from a range of local stallholders, including savoury and sweet food, drinks and other refreshments. Bring the whole family down for a fun day out in support of St John’s Hospice.